The 5 year Nation Action Plan has been written to dovetail with various other strategy documents, including WHO’s Global Action Plan (GAP) on AMR, IACG on AMR’s Framework for Action and the 20 year vision for AMR. Overall, these strategy documents are good news for a number of reasons. First, there is a 5 and 20 year strategy. Not many parts of the world can boast that. Second, IPC is high on the agenda – prevention is better than cure. And third, the need to invest in education and training for those involved in AMR research and clinical practice is recognised. The NAP begins with an overview of how the previous 5 year plan (2013-2018) has made an impact. The NAP is structured around 15 content areas grouped into three sections (reducing the need and unintended antibiotic exposure, optimising antimicrobial use, and investing in innovation, supply and access) as outlined in Figure 1. 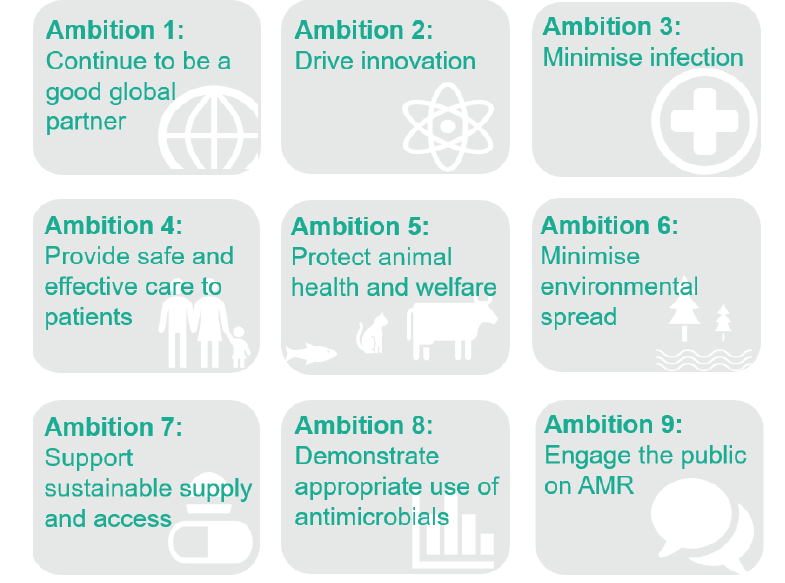 These are mapped onto the 9 UK ambitions for change (Figure 2), which are outlined in the 20 year vision for AMR. Figure 1: A framework for the NAP. Figure 2: The UK’s 9 ambitions for change outlined in the 20 year vision. I’ll focus my thoughts on the section about lowering the burden of human infection, which includes a renewed focus on infection, prevention, and control. It’s interesting that (as far as I can tell) new performance targets have been slipped into this strategy document: to reduce the incidence of a specified set of drug-resistant infections in humans by 10% by 2025, and for healthcare-associated Gram-negative BSIs, delivering a 25% reduction by 2021-2022 with the full 50% by 2023-2024. I’ll be interested to see what exactly the ‘specified set of drug-resistant infections’ includes! England will adopt the Scottish National Infection Prevention and Control Manual. This will be (measured) somehow by the regulators. The DIPC will take on board-level accountability for antimicrobials stewardship. There will be an IPC workforce review, followed by future workforce target recommendations. Some targeted interventions around hand hygiene (will be interested to see what this looks like!). Education work in schools to ensure that school leavers know how to wash their hands and the principles of using antimicrobials appropriately (I would think this should be targeted more at school starters than school leavers!). A survey of public attitudes towards AMR. Supporting the commissioning and execution of IPC-related research by, for example, including AMR as a priority area in contracts between NHS England and AHSNs. Measuring the implementation of national guidelines. Promote research to better understand how AMR spreads within and between animals, humans and the environment, and how to control it. Promote research to deepen understanding about AMR in the environment (including waterways and sewage). Improve surveillance and management of AMR in the food chain. Further tightening the use of antibiotics in human and animal care, by, for example, creating a single portal as a source of data and information on AMR. Invest in the development of new antimicrobial agents. All in all, a comprehensive and ambitious strategy. But will it work? Cast your vote below!